The Van Buren, Ark.-based carrier said it earned $5.7 million, or 68 cents a share, in the three months ended Dec. 31, compared with adjusted net income of $2.8 million, or 35 cents a share, in the same period in 2017. Revenue rose 14.5% to $141.1 million from $123.3 million. CEO James Reed said the company achieved several milestones in the quarter. The company also completed the acquisition of Davis Transfer Co., which provided a boost to revenue and profits in the quarter, Reed noted. Reed also said that further improvements are possible. Trucking generated operating income of $7.4 million in the fourth quarter of 2018, compared with $3.5 million in the same period a year ago. Revenue increased 16.9% to $97.9 million from $83.8 million. Revenue per loaded mile increased 12.1% to $2,361 from $2,106 due to higher rates and network improvements, company officials said. The average number of tractors in the quarter increased 15.6% to 1,883 from 1,629. USAT Logistics generated operating income of $1.3 million in the fourth quarter of 2018, a drop of 35% from $2 million in the same period a year ago. Gross revenue was $43.2 million, compared with $39.5 million, but the company’s gross margin on brokered freight fell to 15% of revenue in the quarter from 17.9% a year ago due to excess capacity in the market driving down prices. For the full year, USA Truck posted consolidated net income of $12.2 million, or $1.49 a share, on revenue of $534.1 million in 2018, compared with net income of $7.5 million, or 93 cents a share, on revenue of $446.5 million in 2017. USA Truck ranks No. 69 on the Transport Topics Top 100 list of largest for-hire carriers in North America. USAT Logistics ranks No. 40 on the TT list of top freight brokerage firms and No. 36 on the TT list of top dedicated contract carriers. 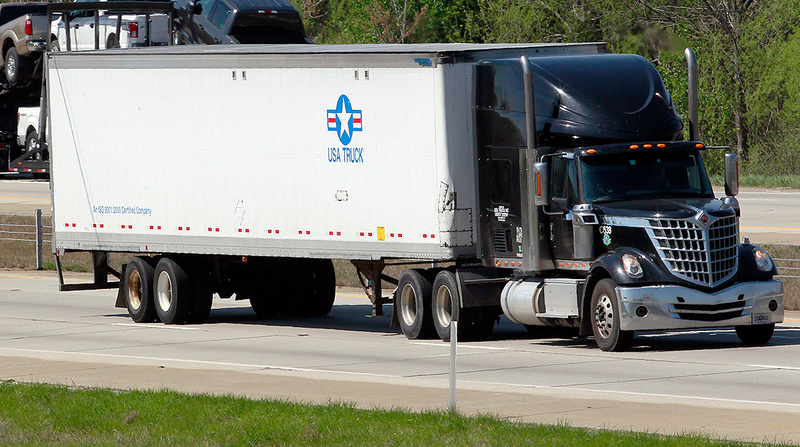 USA Truck Acquires Davis Transfer Co.